Like the Beetle, the Volkswagen Type 2 Transporter is a true “world car,” as likely to be found in Katmandu, as in Valparaiso, Chile, or Pebble Beach. The Transporter shared the Type 1 Beetle’s running gear, which provided it with excellent ground clearance and an ability to run economically and indefinitely on near-kerosene. These adaptable attributes more than made up for the Transporter’s modest power output and low top speed, and helped spread it worldwide. Today the Volkswagen Type 2 is an iconic vehicle for nearly every generation of enthusiast. Dutch importer Ben Pon's original 1947 notebook sketch for a factory runabout led to over 6.5 million "bullis" (as they were called in Germany) being produced in air-cooled and later water-cooled “wasserbus” variations, before the arrival of the front-engine Eurovan in 1993. 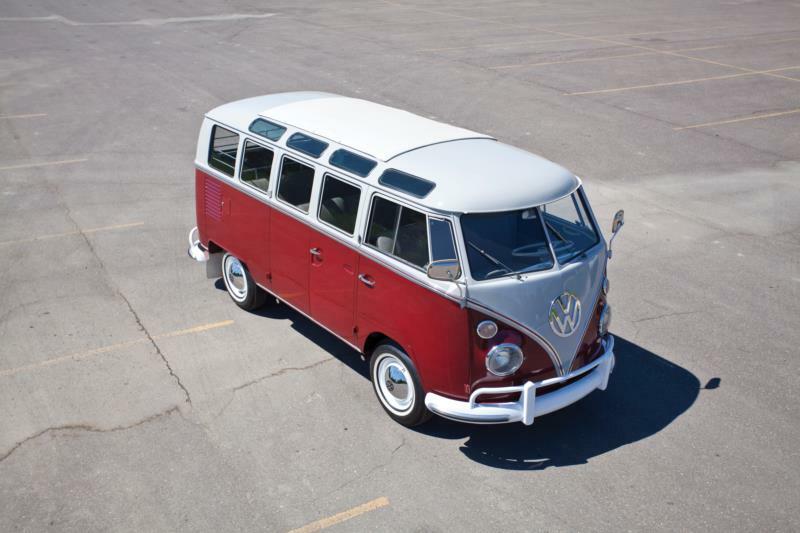 The first generation, or "split-window," Transporter, named for its two-piece windshield, was made from 1950 to 1967. 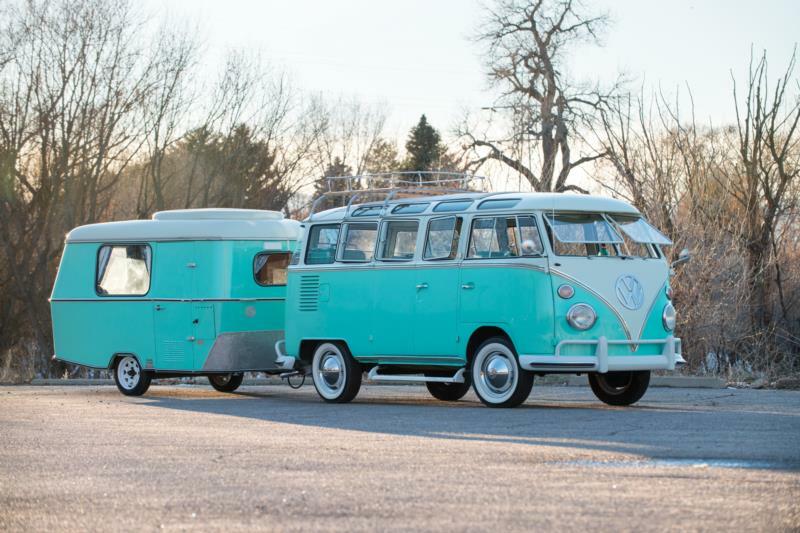 Americans most typically associate the VW Type 2 with the popular Kombi and Samba people-movers which have come to embody 1960s counter culture. In reality, however, there were a dizzying selection of commercial and more utilitarian variations. Volkswagen “buses,” served as ambulances, police cars, hearses, crane trucks, fire trucks, campers, and even railroad speeders. Doors could be ordered on either or both sides. The Volkswagen pickup arrived in 1952 and, while only about one third as many trucks were sold as buses, they proved enormously versatile. The 18-inch space between the original bus floor and the pickup bed proved to be an excellent lockable storage place for equipment. Crew-cab pickups appeared in 1957 accompanied by a shorter five-foot bed, and full synchromesh transmission was fitted from 1959. The one-millionth Transporter was sold in 1962. The Type 2’s original 1,131-cc, 25-hp power unit was enlarged to 1,192 cc in 1953, and power was upped to 40 hp in 1959. The 1,493-cc, 50-hp engine was optional from 1962 and the final 1585-cc engine arrived in 1966. In 1968, the Transporter received a refresh, with more modern conveniences being added to the model. Americans tend to refer to the different models of the collectible split-window buses by the number of their windows. The basic Kombi (popularly referred to as “T1,” “bus,” or “microbus”) is the 11-window version with a split windshield, two front cabin windows, six rear side windows and one in the rear. The sunroof deluxe version has eight side windows and two in the rear. In addition it has eight small skylight windows, thus the 23-window designation. In 1964, Volkswagen incorporated a wider rear door on the bus and the rear corner windows were deleted and this model gained the 21-window moniker. Both the 23- and later 21-Window versions are nicknamed “Samba,” and typically are the most expensive Type 2 today. A “Westfalia” camper series, which could include a sink, refrigerator, stove and a pop-up roof for a bedroom, also have an enthusiastic and supportive following. Parts are no problem for Transporters and many upgrades are easy to execute. High production numbers mean it is easy to find a microbus, though most have been lovingly used for so long that condition can be a common concern. Prices for solid examples are still mostly within reach for most enthusiasts—provided the model doesn’t tick all of the right boxes in terms of window count, colors, and period accessories.